The weather such as heavy rain combined with wind can delay or prolong a tile, granite, or quartz installation. 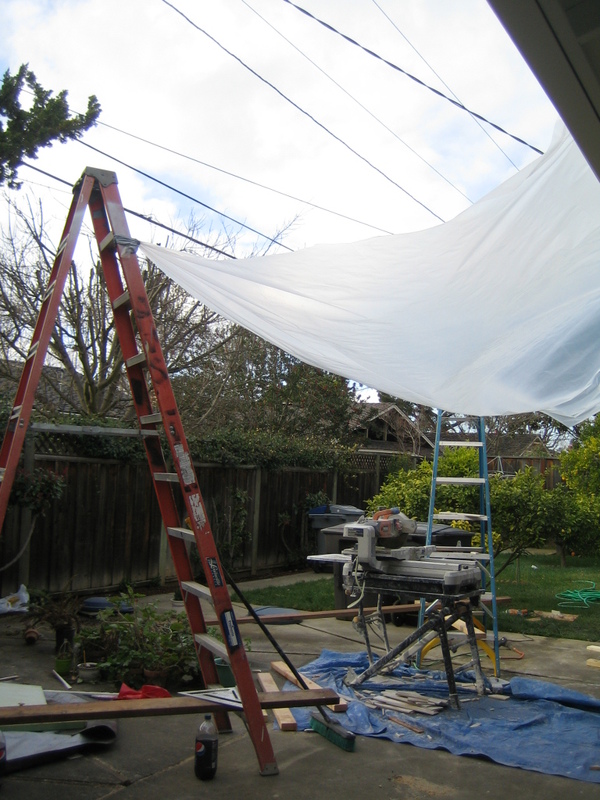 Our installers face two issues, the material getting wet and the San Francisco Bay Area traffic. I will only discuss with you the former since you all know how well we drive in bad weather. When the guys are expecting heavy rain, our granite and tile installation teams pack their tents so they and the material are not rained on. When the granite, quartz and plywood get wet, since it affects the drying time, cutting and worker safety. Tile installation is affected less since the bonding material, thin set is water based unlike granite and quartz which relys on a polyurethane or silicone based adhesives. This is a makeshift tent when my guys were cutting tile in light rain. During heavy rain, Artistic Stone’s Install teams will use the same tents as one may use for a Tail Gate Party before a football game. Go 49ers!!! When installing in at freezing or below freezing temperature, the glue will not adhere to the granite surface because is too cold. This a common challenge for jobs in Truckee, Tahoe or the Sierra Foothills. When installing in these conditions it takes longer than normal California weather for the glue to bond. In our experience 90% of the rainy day jobs get installed. We leave it to our installers descretion to decide whether they proceed or postpone. Our installers decisions is based providing you the best install and their safety since wet surfaces are slippery to walk on and counter tops are heavy(15 pounds per square foot). If you have any specific questions or concerns, please call project manager, Dave in San Leandro about the challenges of rainy day installs. This entry was posted in Installation Day, Fireplace, BBQ Installations, Fireplaces, Tiles, Bathrooms, Prefabricated, Custom Installations, Kitchen, Our Blog. Bookmark the permalink.